Phenom Gallery has just released two new screen prints celebrating the 25th anniversary of Jurassic Park! One of those prints it this killer poster by artist Michael Fitz! Steven Spielberg’s Jurassic Park is one of the biggest films in motion picture history and it deserves an equally larger than life 25th Anniversary Screen Print. So check out this wonderful ode to the park everyone’s dying to visit… get it? 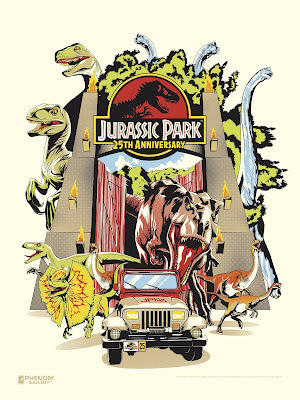 The Jurassic Park 25th Anniversary Screen Print by M. Fitz measures 18”x24” and comes hand numbered and signed by the artist. Limited to just 200 pieces, fans can purchase this Jurassic Park poster now exclusively at the Phenom Gallery online store for $60.